LAS VEGAS — Over 170 exhibitors from McKesson ideaShare 2018 closed out the annual conference held here this week with a donation of 1000s of personal hygiene items, including soap, shampoo and toothpaste to Nevada Childhood Cancer Foundation (NCCF) on behalf of families of children diagnosed with cancer. Established in 1993, NCCF is a local non-profit organization providing over 45 programs and services at no cost to pediatric and adult patients and their families living in Southern Nevada. The NCCF’s goal is to improve the quality of life for critically ill children, their families and adults touched by cancer in the community. When a child is diagnosed with cancer or other life-threatening illness they look to NCCF for support, hope, and courage. Celebrating over 35 years as the one premier community pharmacy education and networking events, McKesson ideaShare 2018 offers an interactive forum for independent pharmacists to improve their knowledge, performance and profitability. 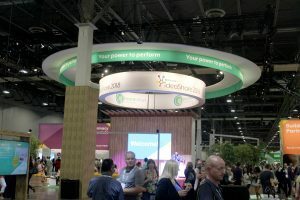 McKesson ideaShare 2018 featured focused learning, interactive exhibits, engaging workshops and networking with peers to provide pharmacy owners with the expertise and tools to maximize their clinical, operational and financial performance.